Eli's mom, Stephanie, says she wasn't shocked when Eli told her she was a girl. There had been signs that Eli was transgender. And even though she knew other people who were transgender, in the beginning, she says, "I did feel like I was scrambling." Stephanie says she and Terry McBride, Eli's father, still had "a ton of questions about it." When they went looking for guidance from the professionals in their lives, they came up short. "The first time we went to our pediatrician, she didn't have a reading list for us," Stephanie remembers. They needed resources and they needed help. Eli was trying to come out as transgender in the first grade and Stephanie and Terry weren't sure what to expect at school. They needed to catch up to their child. At least one of her classmates was kind – she helped her put the barrettes back in when they fell out. But, the playground felt like a combat zone. Kids isolated her, called her weird. One sat next to her, leaned over and said "You look stupid. You're stupid. You're a boy." When Eli’s classmates targeted her that day, she was shattered. She came home from school frustrated and depressed. Stephanie and Terry remember that day, about a year and half ago. Stephanie reached out to Ms. Alexandra Berger, at Roland Park Elementary and Middle School. By now, Stephanie and Terry had done a lot of research on transgender children. They had wisdom to share. And they got lucky: Ms. Berger was eager to receive it. She wanted all their recommendations for websites and books. It was the beginning of their collaboration to support Eli as she made the transition. Over the summer, Eli met with a private therapist who helped her understand her experience. At first, Eli was so saddened from the reactions at school, she didn't want to talk about her gender identity. She told her therapist, "I'm done with that." But, the therapist brought out what they now call "stuffy school." She started talking with stuffed animals about all of their differences - and the feelings they had about their differences. Eli took over "stuffy school" as the teacher during their sessions. Her parents say she seemed to relax. On their summer vacation, she let her hair grow long and wore what she pleased - that meant skirts, leggings, and lots of sequins. She felt good. Her parents say they saw their happy kid again. Then, the school year started. Eli tried to adjust – wearing a boys’ uniform of khakis and a polo to school and changing into her leggings and skirts when she got home. Eli tried to act like the difference between who she was at home and who she was at school was no big deal. But her parents knew it was. Terry and Stephanie worried about the effect all this was having on their child. Ms. Berger started making lessons plans that would set a climate for her classroom - one that would welcome differences. Eli, her mom, and dad found a few more allies at the school: the principal and the school psychologist told her they were ready and willing to learn more. “Everyone said this is new territory for me, but if we do it together we can do it,” Stephanie says. They also met Kimberly Mooney, a middle school Spanish teacher at Roland Park Elementary and Middle School. She leads the school’s Gay-Straight Alliance–known as the GSA. Even though the group is typically for middle school students, Mooney invited second grade Eli. The group meets after school once a week and they discuss everything – or just hang out. On a recent afternoon in June, students slowly ambled into Mooney’s classroom. They showed off their Instagram accounts. Theyed talk about how they try and try to talk to their parents about their transgender identity or about their sexuality, but can’t seem to get through to them. Mooney says she realized there was a need for the Gay-Straight Alliance years ago when she was teaching Spanish at a different school in Baltimore. “There was a student – he became homeless partially because he came out and his mom didn’t approve,” she says. The American Academy of Pediatrics recommends schools have a Gay Straight Alliance. In fact, they say just having a GSA reduces bullying and harassment in school. A 2014 study by the Centers for Disease Control and Prevention found that only 15.1% of schools nationally have Gay Straight Alliances. And only 5.3% of elementary schools have them. In Baltimore, five high schools have GSAs and just one middle school - Eli's. The afterschool club has meant a lot to her. She doesn’t feel alone anymore. She’s gained confidence. In fact, by the end of this last school year, she was giving presentations to all of the second grade classes, with the help of her mom and school psychologist, Cynthia Thorne. One day late into the school year, they visited the last second grade class. Thorne sat in front of about 25 kids. Thorne says after they read the book Who are You? 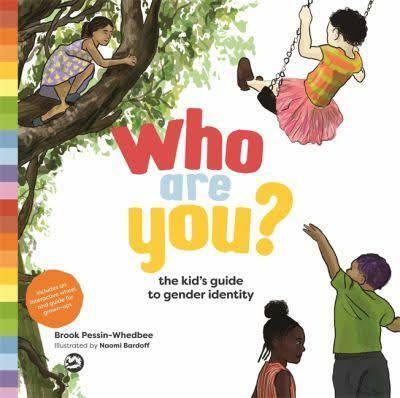 : The Kid's Guide to Gender Identity, she lead an activity that illustrated some of the points made in the book. 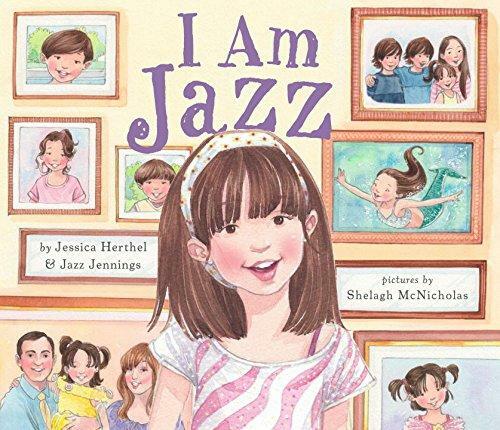 On the second day of their presentation, Thorne read a book titled I am Jazz. It’s about a young person who was born a boy but persistently, consistently, and insistently identifies as a girl. It ends with Jazz feeling happy because her friends and family see her as she sees herself. Then Eli stepped to the front of the class. She’d prepared an autobiographical sketch. Hi, I’m Eli. I’d like to tell you a story about my life. When I was very little I loved trucks. I also liked to try on princess dresses and play with my friends. When I was three and four, I was very interested in dinosaurs. My next passion was Pokemon. I participated in matches and tournaments. I’m getting older now. I like to ride my bike, play video games, play with my friends, and sleep. What I really love to do a lot is read. You might know that about me. What you might not know about me is that I am transgender. That means I was born with a boy body but I have a girl heart and brain. So I don’t’ really think of myself as a boy. I think of myself as a girl. I try to be a kind person and respect and support everyone at our school. I hope this presentation helps you understand about gender. And that you will call me a girl, not a boy. That would make me feel happy. Eli and her mom played a short slideshow with photographs of Eli as a toddler, pre-schooler, and then, as she is in elementary school. Then Thorne took questions and comments. It’s almost time to leave. One young boy raised his hand. "I’d like to nominate Eli for the Honest Brag Tag,” he said. 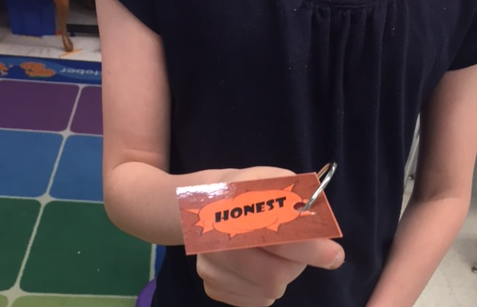 The classroom badge represents ‘honesty.' The teacher explained that it's periodically given to a child who is not only honest with others, but is brave and truthful - to yourself. Education reporting on WYPR is supported in part by the Sylvan-Laureate Foundation. In the past year, various states have taken up the questions transgender kids face when they come out in school. What bathrooms to use, where to get changed for gym class? Those logistics are not the only things to be taken into account. Is there support for kids coming out as transgender, their classmates, and their teachers? 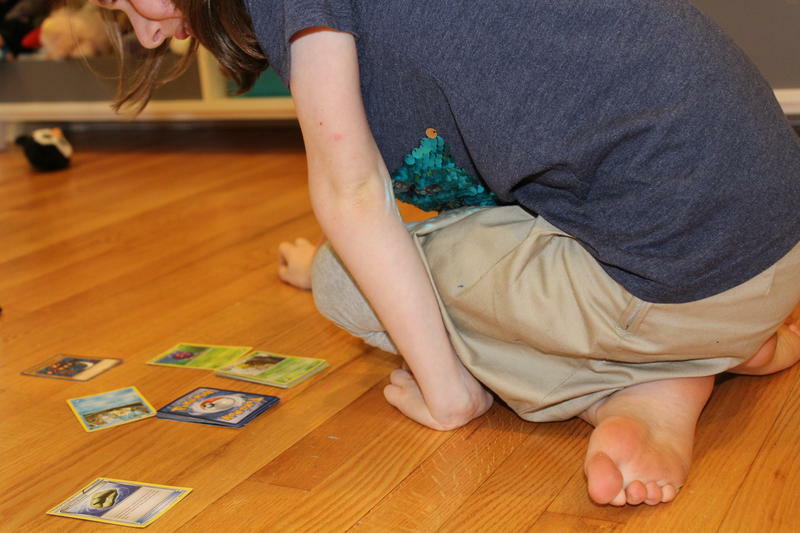 WYPR’s Mary Rose Madden brings us the series "Eight and Out: Transgender in the Second Grade," which centers around an 8-year-old child who wants to live openly as a transgender girl, so she forged her own path. The Roland Park Elementary/Middle School Gay-Straight Alliance, or GSA, was started to ensure that every student of Roland Park has the best school experience possible. Its mission is to provide a safe and inclusive space for all genders and sexual orientations. 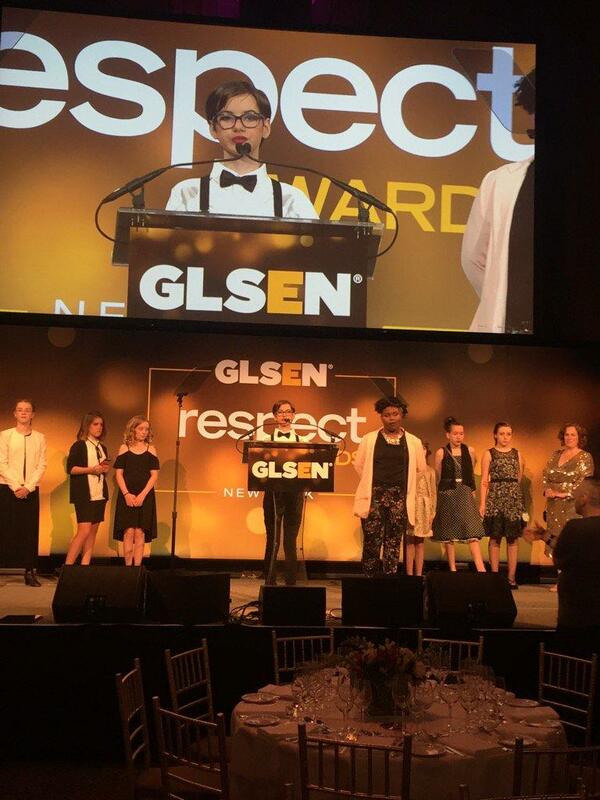 The group recently won the national “GSA of the Year” award from (glisten) GLSEN, a national education organization focused on ensuring safe and affirming schools for LGBTQ students. We talk to several students from the GSA and their advisor, Kimberly Mooney about how the GSA has positively impacted the school's atmosphere.